How accurate are CPP picks? Is the all-in strategy valid? Here are my confidence pool picks for Week 2 of the 2013 NFL Season. 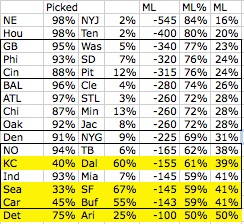 This week gave us a few more contrarian picks than last week, where I had to go all in with a win probability of 34% (San Diego upsetting Houston on Monday night). That ALMOST worked out as San Diego had the lead most of the game and only a Houston TD and pick 6 in the 4th quarter tied the game, with Houston pulling out a game winning FG as time ran out to drop me out of first place. Three teams, KC, Sea, and Car, all have 60% ML win probabilities, but the majority of the public has picked them to lose. Detroit vs Arizona had no line, so I assigned a 50/50 probability for them. Only 25% of the people picked Arizona to win, despite a 50% probability to win. The best pick, according to the numbers, was to go with the Seattle “upset” (upset to the fans, but not to the Vegas oddsmakers). KC over Dallas was a good pick too, but I couldn’t get myself to pick against a team I root for. So I decided to go with Carolina over Buffalo FTW (FTW stands for “For The Win,” for the older crowd). I also did some minor tweaking… for groups of teams that had win probabilities relatively close, I gave a higher pick to teams that had less people pick them to win. 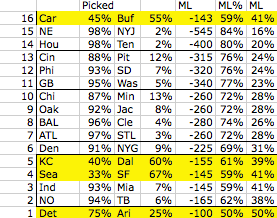 Just a little more contrarian picking to help separate myself from the crowd. So that’s week 2! Let’s see how this goes. My all in pick this week: Carolina over Buffalo.